🏆 MAGNESIUM PAIN RUB | Your go-to for stubborn aches and pains, tennis elbow, arthritis pain, joint pain, hip pain, and any kind of muscle or joint strain + sprain + ache + pain! I use this mainly on my knees and shoulders., At the end of a day on my feet, after yoga and a few hours on the computer, my muscle are wrecked. This stuff is just a soothing + warm + relieving cream. Magnesium Brine + Peppermint + Organic Cayenne Pepper + Essential Oil Blend soothe and release tension + pain. 🌺We use safe dilution levels, Certified Organic Butters, and Magnesium Brine! I started this shop back in 2013! I suffered from PCOS + Hormonal Acne + Auto-Immune + Allergies, so this product is made to be super effective, as well as gentle, because I get it. ; You just want something that works and isn't full of toxic junk and won't irritate your skin. Not something thrown together to make money or copied from another seller. This recipe is composed, carefully, from scratch. We use essential oils that work with your body and then leave, unlike chemicals and heavy metals or artificial fragrances that accumulate in the body, leading to what is called the "Body Burden." 🌿Interested in larger sizes? Head over to our sister site Loner's Apothecary :) Lonersapothecary. com offers more Therapeutic items! No Coconut or Beeswax + Non-Comedogenic + Vegan + No Birch or Wintergreen! Hemp-based + Added Vitamin D3 + Helps aid absorption of minerals and encourages strong bones and teeth! 🌿The scent of this is slightly on the minty side, but not overpowering. Magnesium is a vital mineral that aids in a host of processes in the body. It is said to help with sleeplessness + sore muscles (more pure form of Epsom Salts) + sore joints + restless legs + cramps + proper growth and maintenance of bones. "Magnesium is a mineral that is present in relatively large amounts in the body. Researchers estimate that the average person’s body contains about 25 grams of magnesium, and about half of that is in the bones. Magnesium is important in more than 300 chemical reactions that keep the body working properly. People get magnesium from their diet, but sometimes magnesium supplements are needed if magnesium levels are too low. Dietary intake of magnesium may be low, particularly among women. 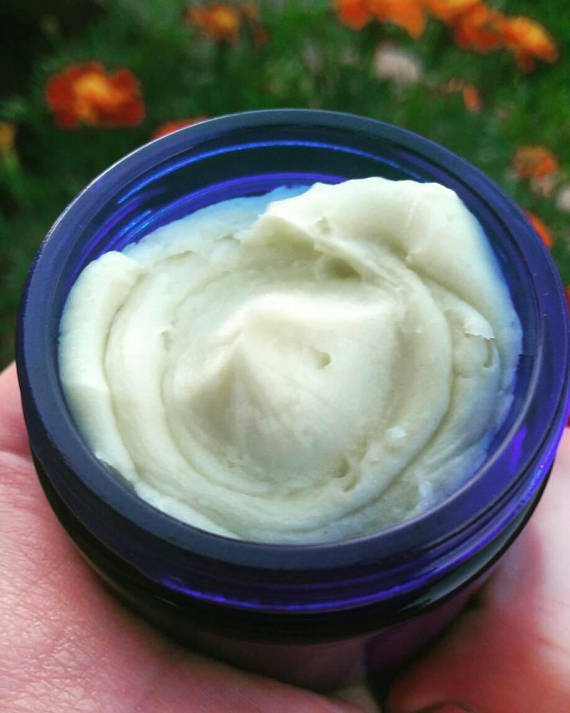 A mix of light + nourishing USDA Certified Organic Shea Butter + Hemp Seed Oil + Sunflower Oil makes up the creamy base. ⭐Magnesium Chloride Brine sourced from the Netherlands + minimally processed so you get all the benefits of this amazing mineral. ⭐Essential Oils of Camphor + Eucalyptus + Clove + Cinnamon + Sweet Birch + Peppermint + Cayenne Infused Sunflower Oil offer relief for tired muscles + joints + feet. ⭐Organic Cayenne is warming and helps increase circulation. ⭐Vitamin D helps to supplement the Vitamin D that your body needs to have healthy bones + teeth. **Sweet Birch is a natural source of Salicates, avoid if pregnant, nursing, and consult physician if if you have a medical condition. This is essentially a naturally occurring Aspirin. Massage desired amount into sore muscles + joints. I usually remove about a pea-size amount for my elbows, double that for knees. For other pains, I offer specialized essential oil blends for sleep and PMS. ⭐⭐⭐⭐⭐Works great! I have suffered a long time with lower back pain and this product helps alleviate the pain at night so I can get a full nights sleep. Will definitely be buying more! ⭐⭐⭐⭐⭐I really like this bed time body butter. The seller was nice enough to send me a sample of her fruity body butter. Very happy with my order,,thank you! ⭐⭐⭐⭐⭐I will definitely be ordering more of this. I've been using it at bedtime for myself and my seven year old son. Feels wonderful.